Healthy and tasty frying only in your dreams? Not anymore! With the Klarstein AeroVital Cube hot air fryer, low-fat food cooking is quick and super easy. You’ll never need to go without outstanding taste: even chips become crunchy and crispy. 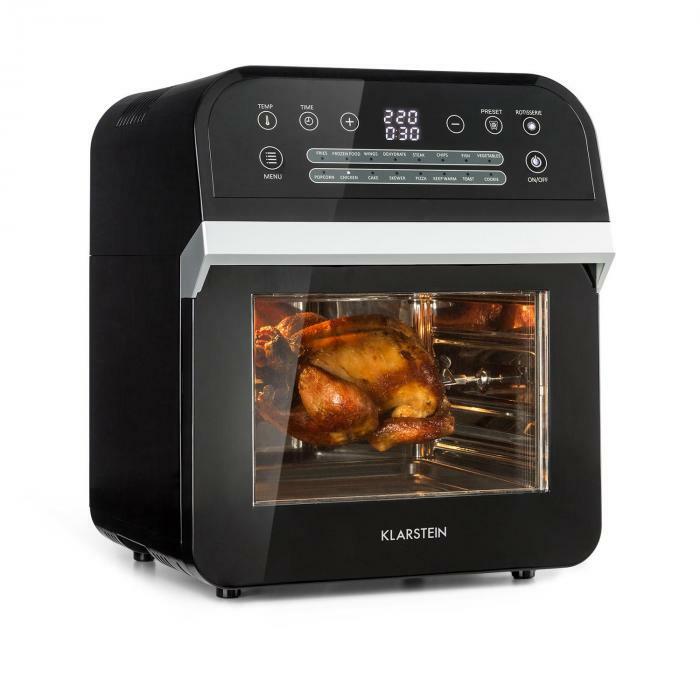 The secret of the Klarstein Aero Vital Cube deep fryer is the 3D Heating System, which deep-fries, bakes, grills or roasts with 1600 watts of circulating hot air. The heat is quickly and optimally distributed thanks to the top-side stainless steel heating element and the rear recirculation fan, and food is gently and rapidly cooked from all sides. Thawing is not necessary. The operation is very simple, because the AeroVital Cube works with Easy Start: select one of 16 programmes via the touch panel and temperature and cooking time are directly preset for the desired dish. You only need to press start, and the deep fryer already begins its service. Of course, individualists can also set the temperature and running time manually. The temperature can be set in 10 ° C increments from 50 to 220 ° C and the cooking time in 1 minute increments up to 60 minutes. Programmes include 13 individual dishes such as chips, pizza, cakes, fish, vegetables or chicken, as well as 3 functions for thawing, keeping warm and drying.The large XXL interior, with its huge capacity of 12 litres, leaves little to be desired in terms of space and can even hold a whole grilled chicken. Thanks to its mini-oven design, the Klarstein AeroVital Cube hot air fryer is particularly compact and occupies just as much space on the sideboard as a conventional fryer! The extensive accessory set is optimally equipped for all purposes: a drip tray for collecting leaking grease, a grill and a grill basket for large and small fried foods such as chicken wings or croquettes and a rotisserie skewer with associated rotisserie lifter, as well as a 360 ° 3D grill cage in which chips are cooked to be evenly crispy on all sides by turning on a skewer. And the best thing is you can fry as you wish, without having to worry about the calories: everything is cooked with hot air, completely without oil. Of course, safety is also important: during operation, thanks to the cool-touch housing, the housing and handle always remain pleasantly cool. For healthy, quickly and comfortably prepared food: the AeroVital hot air fryer from Klarstein.